Reading Cornelis Vleeskens’ divertimenti on random days (Earthdance, 2010), has me thinking of Franco Beltrametti, as occasionally I do. We almost met, courtesy of Tim Longville and John Riley, who’d advised that Franco, our fellow Grosseteste Review contributor, would be visiting London in ’71 – or was it shortly before the Hemensleys returned to Melbourne in ’72? – but that was cancelled. Any meeting in the flesh was forever thwarted by his Beltrametti’s death in 1995. He remains an exotic correspondent, then, from the golden age of hand and typewritten letters, always missed now as though a friend. 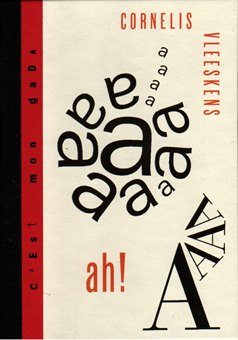 And Vleeskens’ book instantly recalls Sperlonga Manhattan Express, an international anthology edited by Beltrametti (Scorribanda Productions, San Vitale, Switzerland, 1980), because of the A-4 / 210-297mm dimensions and the visual content – Franco’s pictures from all hands and lands (e.g, P. Gigli’s photo of the Berrigans, poems by Koller, Raworth, Gysin, Whalen postcard/cartoon, J Blaine, G D’Agostino, et al); Cornelis’ own montage, drawings, calligraphy, typography – the same mail-art internationale, Fluxus, neo-Dada style more readily recognized from Pete Spence’s affiliations and practice, particularly relevant here because of the latter’s regular appearance in the divertimenti. Vleeskens and Beltrametti are both Europeans who’ve crucially intersected with the anti-formal (looser, casual) English-language poetry – are they ‘casualties’ then? – especially the post WW2 Americans, progeny of Pound and Williams, New York, San Francisco, the West Coast, at a time when Europe was reaffirming its own liberatory tradition (Dada, Surrealism, etc) and, similarly, opening to new worlds. Because they’re not British or North American or Australian, except by adoption, their European origins and references are never out of mind. Not an exact match, by any means – but somewhere along the line they’ve both decided to riff on life and not on literature, though there is a literature of just that sort of thing, and a life that contains literature, music, painting, etc. But theirs is another reminder of the efficacy of the un-made, journal-esque writing – as clear and direct as we reconstruct the Ancient Chinese and Japanese to be, and whose transparency doesn’t necessarily prefer the naive to the esoteric or the well-known to the uncommon (take the music Vleeskens listens to daily and records in his communiques, or his philately habit or the breadth of his correspondence, all noted). What was well started shall be finished. / What was not, should be thrown away. 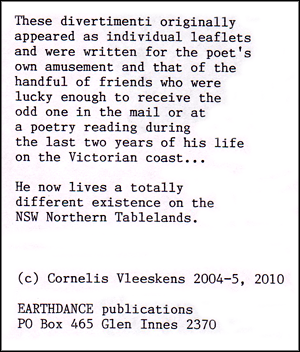 His latest Earthdance chapbook, Sandals in Camel (drawings & poems), is surreal as a narrative and peppered with elsewhere’s place names and distinctions (New York, Parisian, Berlin, Belgian, Catalan, Japanese, Thai, Italian etc), persuading one of his long assumed cosmopolitan ambit. Interesting inference though – ‘texts’ of the life as lived versus ‘poems’ (importantly, formed in the cross-wires of Dutch and English). An earlier collection, Ochre Dancer (Earthdance, 1999), has the same atmosphere and tone of divertimenti or better said, the divertimenti are cut from his familiar cloth differing only in the attitude of making or framing. That’s the discussion then, in the blur of any such distinction these day … bits of life (titles and notes of musical recordings, books, lists of food and drink bought and consumed, incoming mail) intersect with thoughts, observations, conversation. Diversions from the notion of retirement? Retirement from poetic ambition (craft and career)? I identify with that myself. Breaking the cast but keeping one’s hand in, and surprising oneself when something more poem than antidote happens along. The list/letter/journal poetry of our time makes it harder to distinguish source from artefact, but found or made they provide as many pleasures as there are days. Divertimenti is a book which can be taken up anywhere. It invites flicking because of the open-endedness of its narrative. So many dates and times of day, month, year, but the book is always written in present tense, and a sense of the present, in which historical time is subsumed, pervades. 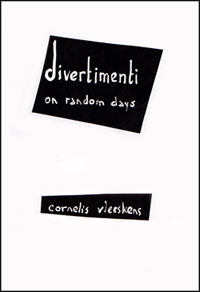 All times in diverimenti are concurrent; even the different places defer to the here of Vleeskens’ whereabouts. Despite it being a kind of ‘in-lieu of writing’ (an ‘in-lieu-of-writing writing’? ), possessing the light touch of genial conversation and a journal’s talking-to-oneself, it also teases one as a discourse on time and place, and of poem as its own place where, paradoxically, its own mercuriality might be traced. This is an excerpt from Kris Hemensley’s blog, Poetry & Ideas. This entry was posted in GUNCOTTON and tagged Cornelis Vleeskens, Franco Beltrametti, Kris Hemensley. Bookmark the permalink. Kris Hemensley, along with Loretta Hemensley and Cathy O'Brien, manage Collected Works bookshop. He has published over twenty collections of poetry. His current project is The Merri Creek series.